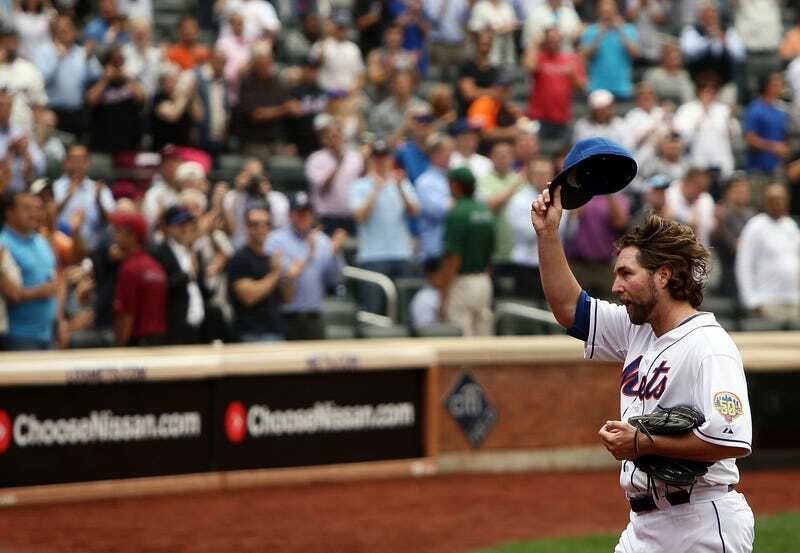 As has been rumored, wailed about, argued over, and mourned for a few days—and really, since Dickey became valuable enough to strain the finances of the destitute Mets—R.A Dickey is now, officially, almost definitely headed out of New York. We'll update when we know the terms (Rosenthal notes that the option for an extension, on which the deal apparently hinges, may be negotiated until Tuesday at the latest), but while we all wait with pits in ours stomachs, it's worth revisiting the archives to remember why we like the guy so darn much. Update: The rumored terms are more or less what they have been since the negotiations began. Update 2: Meet Mr. d'Arnaud: "Every time I hit an opposite field home run, I run around the dugout yelling 'oppo taco' and I tell my whole family about it..."